“(1) Come, let us shout joyfully to Jehovah! Let us shout in triumph to our Rock of salvation. (2) Let us come into his presence with thanksgiving; Let us sing and shout in triumph to him” (Psalm 95:1,2). “My mouth shall praise Thee with joyful lips” (Psalm 63:5). Here is a recording of Hymn No. 23 from the “Hymns of Dawn” to aid God’s people in singing and making melody in their hearts unto God. Thro’ all their actions run. His zeal and faith to prove. To run the heav’nly way. 1 Corinthians 13:4-8, 13 (NRSV) — (4) Love is patient; love is kind; love is not envious or boastful or arrogant (5) or rude. It does not insist on its own way; it is not irritable or resentful; (6) it does not rejoice in wrongdoing, but rejoices in the truth. (7) It bears all things, believes all things, hopes all things, endures all things. (8) Love never ends. (13) And now faith, hope, and love abide, these three; and the greatest of these is love. John Fawcett was a British-born Baptist theologian, pastor and hymn writer (Wikipedia). “In 1772 he was invited to London, to succeed the celebrated Dr. J. Gill, as pastor of Carter’s Lane; the invitation had been formally accepted, the farewell sermon at Wainsgate had been preached and the wagons loaded with his goods for removal, when the love and tears of his attached people prevailed and he decided to remain” (https://hymnary.org/person/Fawcett_John1740). Composer — Lowell Mason (1792-1872, who is considered “the father of American church music”) arranged this hymn’s tune titled “DENNIS” which he first publishing in The Psaltery in 1845 (a hymnal he compiled with George Webb). Mason attributed the tune to Johann G. Nageli (Switzerland, 1773-1836) but included no source reference (https://hymnary.org/tune/dennis_nageli). “If we walk in the light as he is in the light, we have fellowship one with another, and the blood of Jesus Christ his Son, cleanseth us from all sin” (1 John 1:7). True fellowship implies love, sympathy, a mutual sharing of good or ill, common principles, common interests, and a common aim. It may exist between parties on equal footing, or between those whose conditions are widely different. Where the latter is the case, benevolence [kindness, goodness, compassion, thoughtfulness, decency, charity] on the part of the superior is shown in acts of favor and blessing, and on the part of the inferior, in gratitude and such returns in action as are possible. Than such fellowship there is nothing more desirable and more helpful to the saints in the narrow and difficult way they are called to tread. But while we should ever seek and cultivate such fellowship, we need to be very careful to see that our fellowship one with another, is based upon correct principles, else that which was designed as a blessing, will be found to our great disadvantage. Realizing this, the Apostle Paul admonishes us, saying: “Be ye not unequally yoked together with unbelievers, for what fellowship hath righteousness with unrighteousness? and what communion hath light with darkness…or what part hath he that believeth with an infidel?” (2 Cor. 6:14,15.) “How can two walk together except they be agreed?” It is impossible. Let us see to it, then, that our fellowship is based upon the sure foundation referred to in this text—the blood of Jesus Christ that cleanseth us from all sin—and that our rejoicing and communion be of the increasing light as we walk together. And this great blessing, the Apostle John tells us, it is our privilege to have. He says we may have fellowship with our Father, and with his Son, and also with other saints who are walking in the light—the truth. God speaks to his children through his Word, and he is acquainted with all our circumstances and hears our prayers, but it is a great mistake to imagine that we have communion and fellowship with God, when we only speak to him in prayer, and never examine the Word to hear him speak to us. We may speak and then listen, but we need to hear much more than we say. Thus we have communion, interchange of thought, fellowship. None can thus commune with God without becoming acquainted in some measure with his truth, and if they are in harmony and fellowship with him, his plans and purposes will become theirs. If they do not desire to obey the truth, they will deceive themselves in an endeavor to disbelieve it, and to substitute something else in its place. And while doing this many hold to the form of sound words while denying their import. But if as children of the light we walk in the light, not only shall we have fellowship with our Father and our Lord, but we shall also have fellowship with other saints who are walking in the same narrow way. “We trust in the living God, who is the Savior of all men—specially [or most fully and everlastingly] of those that believe.”—1 Tim. 4:10. “To us there is but one God, the Father, of whom are all things, and we in him; and one Lord Jesus Christ, by whom are all things, and we by him.”—1 Cor. 8:6. Worthy of the vocation wherewith we are called, with all lowliness and meekness, with longsuffering, forbearing one another in love; endeavoring to preserve the unity of the spirit [oneness of mind] in the bond of peace. There is ONE BODY [Church], with ONE SPIRIT [one sentiment or disposition], even as we are called in ONE HOPE of our calling; ONE LORD, ONE FAITH, ONE BAPTISM, ONE GOD AND FATHER OF ALL, who is above all and through all and in us all.—Eph. 4:1-6. THE ONE BODY—is “the Church of the living God, the pillar and support of the truth;” “the Church of the first-born” “whose names are written in heaven;” the “little flock,” to whom it is the Father’s good pleasure to give the Kingdom; the members in particular of the body of Christ; prospectively, Christ’s Bride and joint-heir; the “Seed of Abraham,” of which our Lord Jesus is Head. Since Pentecost this Church of Christ has been in process of selection from among justified believers, or the general “household of faith;” and its members, when complete and glorified, unitedly shall inherit the Abrahamic promise and bless all the families of the earth.—Gal. 3:16,29. THE ONE SPIRIT—is the spirit of the Truth, the spirit of God, the spirit of adoption as sons of God, which actuates and governs all who are of the ONE BODY, in vital union with the one Head, Christ Jesus. It is the spirit of holiness, and chief among its fruits is Love. THE ONE HOPE—which inspires all the members of the one body of Christ, who have the one spirit of the Truth, is “the hope set before us in the gospel,” and not hopes suggested from our own or other men’s imaginations or conjectures. The one hope is a “good hope” (2 Thes. 2:16), a hope of eternal life by a resurrection. (Titus 3:7.) The ground of this hope is found in Jehovah’s promises, confirmed unto us by the death of our Lord Jesus as the ransom price for our sins, and by his resurrection from the dead for our justification.—1 Pet. 1:3; Acts 17:31. THE ONE LORD—is the Head or Chief of the one body—his Church possessing the spirit of the Truth and actuated by the one hope of becoming his Bride and joint-heir. He and his Father are one, even as he and his church are one. (John 17:11.) He is the Redeemer of his church as well as her Lord, Exemplar and Master. And he is the Redeemer also of the whole world, and by virtue of that office he is to be the world’s Deliverer from Adamic sin and death. He it is who in all things has the pre-eminence in Jehovah’s plan and work. He was not only “the beginning of the creation of God,” “the first-born of every creature,” but more: he was the “beginning and the ending,” he was the “Alpha and the Omega, the first and the last,” of Jehovah’s direct creation; for all other “things were made by him, and without him was not any thing made that was made.” (Col. 1:15,18; Rev. 3:14; 1:8; 21:6; 22:13; John 1:3.) He it is who, to carry out the Father’s gracious plan, willingly left the glory which he had with the Father before the world was created, and became a man—a little lower than the angels—that he might, as a man, present himself in sacrifice for the sins of man. Thus we behold him as the “Mediator between God and men, the man Christ Jesus, who gave himself a ransom FOR ALL.” (1 Tim. 2:5,6.) By his willing sacrifice of himself for men he bought Adam and the entire race condemned through his fall, and became Lord of all—not only of the living, but also of the dead, with full power and authority to awaken and restore to all that was lost whosoever accepts of the New Covenant of divine favor which, by his death, he sealed and made effective to all. But our Lord is no longer in the flesh, no longer a human being. He has finished the work of ransoming us, for which the taking of the flesh was needful. He was indeed put to death in the flesh, but was quickened [made alive] in the spirit. “Though we have known Christ after the flesh, yet henceforth we know him [so] no more.” As he was begotten of the spirit at his baptism, so he was born of the spirit at his resurrection; and “that which is born of the spirit is spirit.” “Now the Lord is that spirit.” (1 Pet. 3:18; 2 Cor. 5:16; John 3:6; 2 Cor. 3:17.) Because he showed his obedience to the Father, and his confidence, in that he humbled himself to become a man and tasted death for every man, therefore God highly exalted him—far above manhood, far above the angelic nature; even far above his own glorious previous station, and gave him a name [title] above every name, that at the name of Jesus every knee should bow and every tongue confess, to the glory of God the Father. He made him partaker of the divine nature and honor, “that all men should honor the Son even as they honor the Father.” “He is Lord of all.”—Phil. 2:8-11; John 5:22,23,26; Acts 10:36. THE ONE FAITH—is that we were reconciled to God by the death of his Son, who died for our sins, the just for the unjust, to bring us to God; by whom we have accepted the at-one-ment with God, offered unto us. Wherefore, we have peace with God through our Lord Jesus Christ; being cleansed by his blood [sacrifice], we are brought nigh to God and are no longer strangers and foreigners, but children and heirs of his favors, prepared for those who love him when brought nigh through the precious blood. Through this faith we grasp the exceeding great and precious promises of God as rapidly as we see them, and gladly appropriate them to ourselves. Faith anchors our hearts securely to the precious things of the future, though unseen as yet except to the eye of faith. Faith is the power of God to every one that believeth. THE ONE BAPTISM—Those of the one BODY and one HOPE, joined to the one LORD, possessing the one FAITH, are all baptized or immersed into Jesus Christ. (Rom. 6:3.) As individuals they have reckonedly ceased to exist: henceforth, for them to live is for Christ to live. With their wills buried or immersed into the will of Christ, they thenceforth live, not unto themselves, but unto him that bought them with his own precious blood. Their own wills are dead, and henceforth they recognize only the will of the one Lord, the Head of the body, which is his church, whose names are written in heaven. Justified believers attain membership in this Church of Christ through this burial or immersion of their hearts, their wills, into the will of Christ. And as the Apostle further declares, this immersion of our wills (ourselves) into Christ is acceptable only when it is an immersion even unto death—an entire, a complete immersion forever. “Know ye not that so many of us as were immersed into Jesus Christ were immersed into his death? Therefore we are buried with him by immersion into death; that like as Christ was raised from the dead by the glory of the Father, we also [from the time of our consecration, the immersion of our wills into that of the one Lord,] should walk in newness of life. For if we have been planted together in the likeness of his death, we shall be [sharers] also in the likeness of his resurrection“—the first resurrection, to be with him and like him, partakers of the divine nature. (Rom. 6:3-5; Phil. 3:10,11.) This is the only real baptism, of which immersion in water is only the beautiful and appropriate symbol. Br. Charles Russell—the founder of the Bible Students movement, who is the compiler of “Poems and Hymns of Millennial Dawn” which was published in Allegheny, Pa., in 1890. This Bible Students’ devotional originally contained a total of 151 poems and 333 hymns. The following prefatory to the 1905 publication of Hymns of Millennial Dawn may be of historical interest to many of our readers. We published in 1890, with several more recent editions, a volume entitled “Poems and Hymns of Millennial Dawn” without music. The same collection of hymns with the music is now urgently needed, and therefore appears in this volume. The poems, although highly prized, are omitted for greater convenience in size. We have preserved the same alphabetical order, because so many of our readers have the older book; and where a different tune is given from that originally suggested the latter is indicated by Alt. for alternative tune, with the number where that tune can be found. Both words and music are credited to the same class to whom the work is dedicated-to the Lord and His faithful people, “the Saints.” The authors of many of the best of them are unknown to us, and, besides, slight changes have been made in the phraseology and sentiment of quite a number, which we could not be sure their original authors would approve, and to give personal credit to less than one half would seem invidious. To all of these dear “Saints” of all ages we therefore give united and hearty thanks for the blessings which they, as the Lord’s servants and handmaidens, have bestowed upon their fellow-members of “the Church of the Firstborn, whose names are written in Heaven.” Most of them died long ago: their abundant reward will be of the Lord in the resurrection. That the collection is thoroughly undenominational, unsectarian, will be manifest to those recognizing the fact that it includes the choicest old hymns and tunes used by all denominations. Although we have gathered far and near and winnowed carefully we cannot hope to have gotten all the golden grains, though we do hope that no chaff can be found. The collection is for the Church, for “believers” “reconciled,” and hence contains none of the “sinners” hymns, such as “Come, ye sinners poor and needy,” because willful sinners are in no sense members of the “Body” of Christ, nor are those who have not yet accepted the Lord as their Savior. 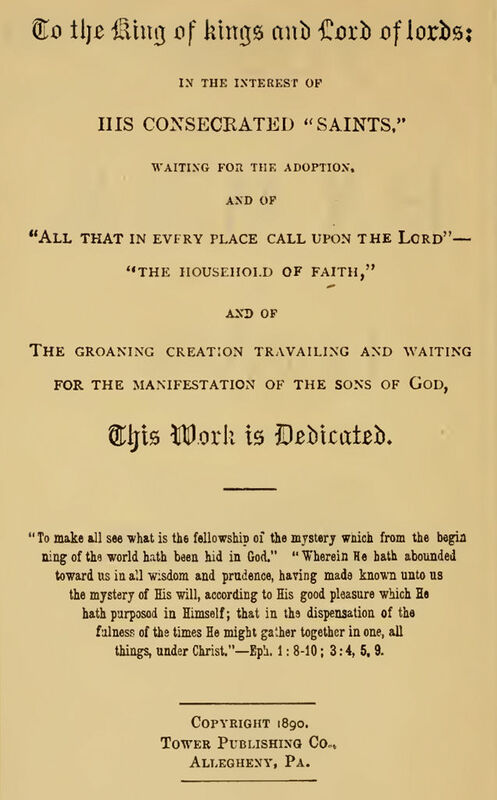 Those who will feel the deepest interest in this collection, and whose sentiments will be most fully voiced in its verses, will undoubtedly be those in fullest degree of sympathy with the divine plan of the ages, as set forth in the several volumes of Millennial Dawn – the eyes of whose understanding have been opened to the clearer, purer light now shining from our great Redeemer’s cross, showing the fulness and the completeness of his salvation. In fact, this volume, while not numbered as one of the volumes of the Millennial Dawn series, is designed to be a companion volume, a melodious accompaniment to the “new song,” “the song of Moses and the Lamb” (the grand harmony of the Law and the Gospel), as presented in the regular Dawn series. Let the music of God’s good and great plan ring through your hearts and lives, dear fellow-pilgrims and fellow members of the “royal priesthood,” so that every day and every hour shall be filled with joy and praise and thankfulness! And that this little volume may assist in deepening the work of grace in your hearts is our hope and prayer. Later on, the hymns from this book formed a basis for the hymnal titled “Hymns of Dawn” which was published by the Dawn Bible Students Association in East Rutherford, New Jersey (USA) and the 1999 edition contains a total of 361 hymns. Making Peace by Br. Rick Suraci. What Does It Mean To Be Baptized Into Christ? Are You In the Little Flock? OUR BELIEFS — What Does The Bible Teach Us?